Need a cool gift idea? Check out Groupon! Shopping for friends and family can be a lot of fun- if you know the person’s likes, or have a general theme in mind. For instance, if you know your brother loves golfing, you can find a golf related gift easily. But what if you need a gift and you have no clue what to buy? Sometimes, you can simply run out of gift ideas for a particular person. We had this problem with a family member recently. We were stymied as to what we could buy. Then we logged into Groupon and found several cool gift ideas. My thanks to Groupon for sponsoring today’s post. All opinions and love of saving and shopping are my own. We use Groupon often for food and entertainment savings in our area, so I usually go straight to those categories and do a quick search for a certain type of cuisine or event, usually on my phone, so I’d never taken in the full site on my laptop until recently and I was pleasantly surprised with the site. 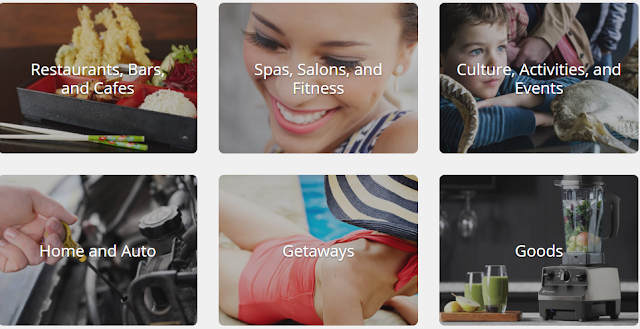 It’s easy to navigate, with six main categories on the home page. Thinking of our gift recipient, I chose Goods and found wonderful offers from stores like Bath & Body works (my daughter’s favorite store) along with Walgreens and Kate Spade, but those weren’t quite right for my needs. Then I saw a Macy’s sale, which is always a favorite shopping destination, so I clicked there. Several really nice savings coupons were listed, which helped me narrow down my gift shopping theme even more. I was able to find a cool gift quickly and affordably using Groupon! If it’s been a while since you used Groupon coupons, log on today and check out them out. I bet you’ll be find several cool gift ideas in record time as well. Be sure to follow Groupon on Facebook and Twitter for more savings and shopping ideas. Please share in comments: Do you struggle with gift ideas for a family member or friend? Disclosure: I will receive monetary compensation as a thank you for posting this advertorial for Groupon. Thoughts are my own. WOW! I had o idea Groupon had all of that! Great selection! I am goign to have to look at Groupon more often! Groupon is awesome. I recently bought a whole set of makeup brushes on there and they work great for a cheap price! I'm a huge fan of Groupon. I've saved a lot of money that way. I am a huge Groupon fan already and their coupons are terrific. We use them a lot for food, but I wasn't aware of all their great deals until recently. Fantastic find! I love beauty supplies on sale! Me too! It's like wasting money if I don't check Groupon first. Saving with them is the best!